As promised, here’s a quick post to show my new haircut! I went for something short but not too short and I’m really pleased with it! It looks a bit wavy in this picture as I’ve just come in from the rain, but I just wanted to show you anyway. 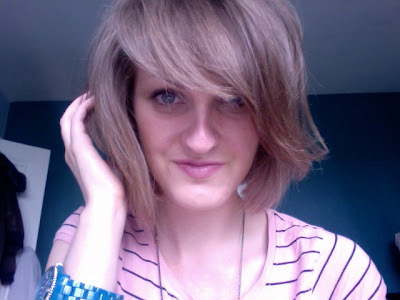 I’ve kept my side fringe but had it trimmed slightly and had a few of my layers cut back in. I love it! Looks really nice, bit like Nicole Roberts sort of style, but cuter.